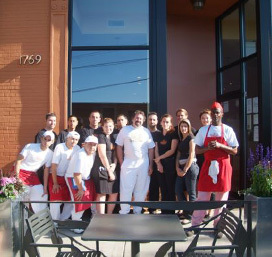 February 14th, 2009, Valentine’s Day marks our third anniversary and we are thrilled to be entering our fourth year at Spacca Napoli. This anniversary makes me reflect on my beloved and loving staff and the wonderful camaraderie that has evolved here. In his truly inspiring book, Small Giants, Bo Burlingham talks to small business owners and asks them what makes their businesses thrive. There is consensus how it is due to the working relationships that are built together over time. I recognize that my staff’s contribution to the Spacca Napoli community is a big part of who we are, and I think many of our guests consider them family like I do. I look forward every day not only to getting into the dough room, thinking about what I can offer, talking with my vendors and their drivers, and seeing new and regular customers, but also to my daily contact with all who work at the pizzeria. Over New Years Ginny and I traveled to San Francisco to be with family and friends. We are all ‘buon gustaios — that means good eaters. A16, Delfina, and Perbacco are great restaurants to visit. A16 has come out with a very exciting book, A16 Food + Wine which has fabulous wine notes. I can’t wait to sit down and slowly absorb them. We continue to introduce new pizza, courtesy of our friend Roberto Caporuscio such as La Cacciota which has cacciota di pecorino, bufala, and eggplant; Mascarpone, with gorgonzola torta di mascarpone, cherry tomatoes, mushrooms, and ricotta; and Il Padrino, with cacciocavallo, soprasatta picante, and gaeta olives. Roberto is about to open a pizzeria and school in New York City on Bleeker Street called Keste, Pizza, and Vino. Should you be in New York, Peasant is another restaurant on Elizabeth Street that is not to be missed. They feature rustic cuisine, very much like La Vecchia Bettola in Florence. Another fun place to visit is the Obika Mozzarella Bar on Madison Avenue. Their focus, of course, is on bufala mozzarella. They offer only mozzarellas made from the bufala milk of selected DOP producers in the Paestum and Piana del Vulturno areas around Napoli, Paestum being a very delicate taste while that of Piana del Vulturno has a stronger profile. Besides continuing to be influenced by Roberto’s ideas for new pizza combinations, some of our old favorites are back on the board. La Fontina features bufala, porcini, and crudo; the Cafuncella has smoked mozzarella, pancetta, and rosemary roasted potatoes; and the Mailina with guancialle are just a few examples. Our velvety polpo al sugo which is octopus simmered in San Marzano tomatoes, gaeta olives, capers, garlic, and parsley is truly a winner. End of the meal cannoli and chocolate infused grappa are also a lot of fun. Next up is the annual Pizza Expo in Las Vegas. The expo is a great place to network and attend seminars. I have two good friends there, John Arena and Sam Fachini, cousins and owners of the Pizza Metro Pizzerias. I consider John and Sam my ‘consigliere’ and love to be in their presence. Together they have over 70 years of pizza experience combined. I met them several years ago through Penny Pollack and Jeff Ruby who are food editors of Chicago magazine and authors of the informative book, Everybody Loves Pizza. John and Sam grew up in Little Italy, New York, just steps away from Lombardi Pizzeria on Spring Street which was the first licensed pizzeria in the US circa 1905. At the Expo I stay close by Antimo and Eugenio Caputo, of Molino Caputo, the makers of our imported Neapolitan flour, my pizza grande friends Roberto Caporuscio and Antonio Starita, and Fred Mortati of Orlando foods, the importer of our Accademia Barilla products. I cannot tell you how much I learn when I am around and in dialogue with all of them. To me they represent what pizza is all about. To all who read this, again my best wishes as we settle into the 2009. Thank you for all of your kindness and support. Happy anniversary! Auguri, tre anni.